PEEL the 3 sweet potatoes using the potato peeler. CUT into wedges using the chef’s knife and cutting board. PRE-HEAT your oven to 425 degrees fahrenheit or 220 degrees celsius. COAT the sweet potato wedges with olive oil, you can transfer them to the pre-lined baking sheet for this. WHISK together 2 tablespoons cornstarch, 1 teaspoon chili powder and salt to liking in the small bowl. 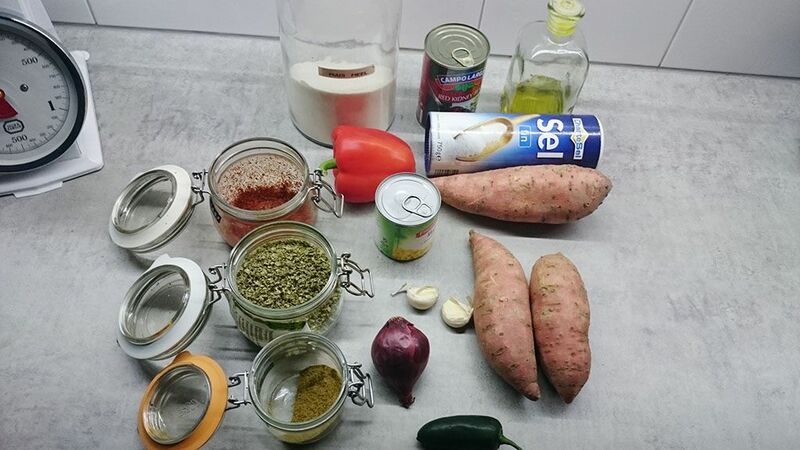 SPRINKLE the mixture over the sweet potato wedges, stir until evenly distributed. BAKE the sweet potato fries for 35 minutes, tossing a few times while baking. DICE half a red onion, jalapeño pepper and red bell pepper. DRAIN liquid from the cans of corn and red kidney beans. PREPARE the rest of the dish about 15 minutes before the fries would done baking. HEAT olive oil in the large non-stick skillet over medium heat. ADD chopped garlic, red onion and salt to taste. BAKE until glazed, usually around the 2 minute mark. STIR in diced red bell pepper, corn and red kidney beans. Bake for 5-7 minutes, or until tender. ADD 1 tablespoon dried oregano and 1 tablespoon ground cumin. Taste, and add more salt or chili powder if needed. REMOVE fries from the oven, sprinkle with a large pinch of salt. DIVIDE between plates, top with the vegetables. 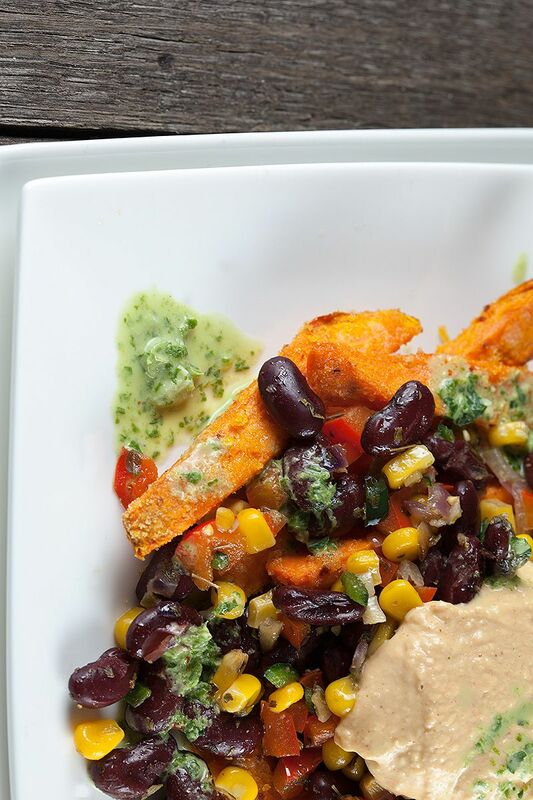 ADD créme fraîche, salsa, guacamole or hummus to liking on top of it all. 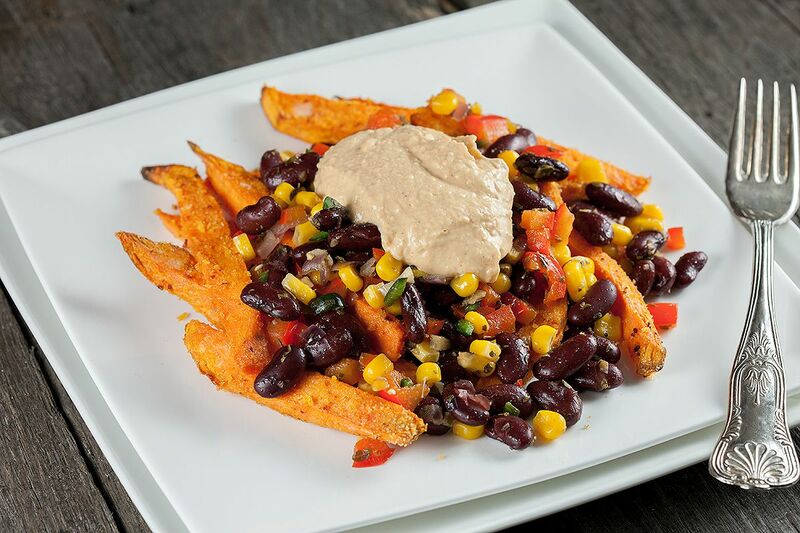 Enjoy your sweet potato fry nachos! 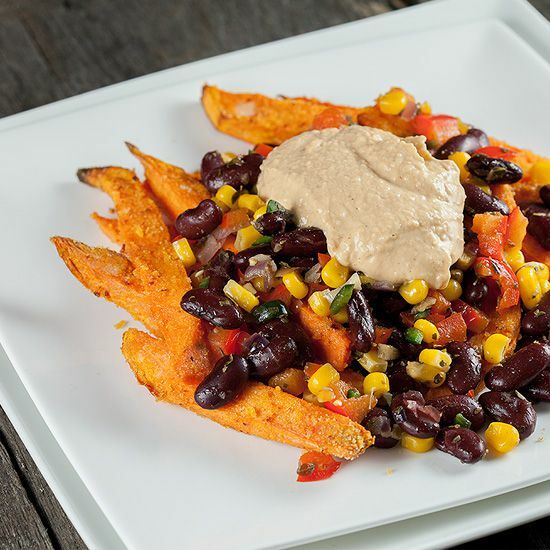 Never would have thought to use sweet potato fries as a nacho base – but now that I’ve seen this I have to try it!